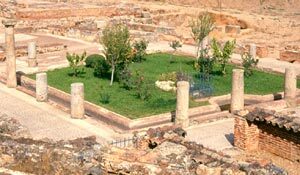 Domus of Amphitheater, at Merida, Badajoz. Dating it at 1st century is uncertain, because, as it happens to other domus, restorations suffered during more than three centuries make it uneasy. Its place, close to the Amphitheater, gave it its actual name. Around it parts of the aqueduct of Saint Lazar and a Mausoleum can be found. Structure of this house makes us imagine a great and outstanding one inside the city. It is so great that we can speculate on its unity: it is not impossible that it was composed by two cities joined by a corridor. It is conceived on a trapezoid peristylum, composed by 18 columns. At its center there was a well. Corridors were paved with mosaics, as the most important rooms. At one side of the entry there was a kitchen. At the South-Western one, rooms called "of paintings", because of geometric representations on the walls. A main triclinium is decorated with mosaics showing scenes of grape harvest -Autumn mosaic- and Venus with Cupid. It has termae at a next building, but scholars are not sure whether termae belonged to this house or not. 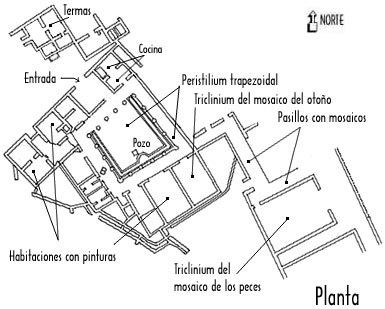 After being left, a necropolis was founded on this place.